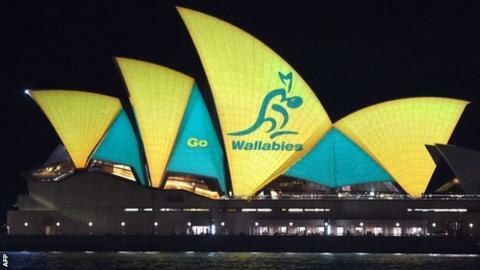 The iconic Sydney Opera House was turned green and gold on Friday in support of the Australia national rugby union team. The Wallabies face New Zealand in Saturday's World Cup final. In response, BBC Sport asked readers of Sportsday live - our rolling, text-based sports news service - to suggest other famous landmarks which could be given a sporting facelift. The response was hilarious. Check out the memes which were created below. Manchester United fans loved midfielder Park Ji-sung - but was he good enough to have the world's most iconic park named in his honour? Liverpool striker Christian Benteke's face on a clock - what could go wrong? Niagra Falls and certain footballers... can we say much more?